The whole thing with Mercedes-Benz Ponton glow plugs is this: The plugs are wired in series and each are rated for 0.9 volts. That means that in total the string of 4 is rated for 3.6 volts. So, we've got 12 volts (+ or -) coming from the battery through the headlight switch to the glow switch on the dash. From the glow switch (position 3 on the pull knob) 12 volts is sent to the glow resistor that sits on the flat shelf just behind the fuse panel which eats up most of the 12 volts and puts out roughly 3.6 volts to go into the #4 glow plug then out of the #4 and into the #3 and so on until it gets to the "out" side of the #1 plug where it is grounded to the engine block. 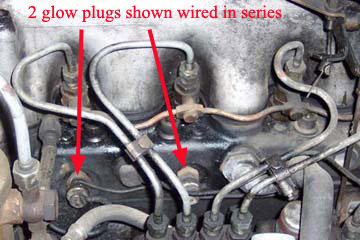 There is also another set of wires from the glow switch over to the glow indicator that is not in series with the glow plug circuit and is not required for the glow plugs to work. You may just have trouble with the indicator and not the glow circuit itself. First off, I suggest making sure the ground is good. This photo shows the glow resistor, with the heat shield in place to keep combustibles away. 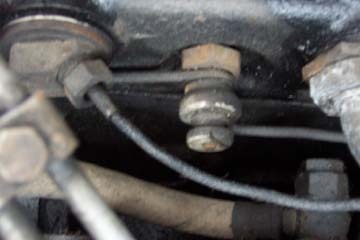 To clean it, remove the wires and then remove the two bolts holding the heat shield down. I believe the bolts are 10mm. Clean it up well to be certain of good contact with the wires. If you need to get more voltage from the resistor on the plug side, just take the resistor out and shorten it up a little, twist the end into a loop and re-assemble, then re-install. These old beasts often get grounds lost through corrosion and whatever so check that first. Next, make sure the battery is charged right up. 13.5 to 14 volts right at the terminals on the battery is good. Then, hook the (-) volt meter lead to the (-) on the battery and the positive to the terminal on the side of the glow resistor towards the REAR of the car. Activate the glow circuit and check the voltage. If it's about 12, so far, so good. If it's not, then the problem is between the battery and the input side of the resistor. If you have 12 volts at the input side of the resistor, check on the other side of it. Should be between 3.5 and 5. If not, then the resistor is cooked. A digital voltmeter is very helpful in this process. So is a fully charged battery. All of these readings are dependent on having 13 to 14 volts from the battery. REMEMBER: The wiring on these old beasts is, well, "old" and many times things just stop working from age and years of use, misuse and abuse. This is an excellent photo of how the "series" (sometimes referred to as, "in-line", or "daisy chain") wiring arrangement is accomplished on the plugs. The bar coming from the right is insulated from the engine block, and is connected to one end of the glow element (the "outer" side, as in out away from the engine) that is inside the pre-combustion chamber in the block. The white piece with a bit of dirt in between the left and right buss bars on this plug is a ceramic insulator. The bar on the left is connected to the other end of the glow element (the "inner" side, as in close in to the engine) and completes the circuit for that individual plug. 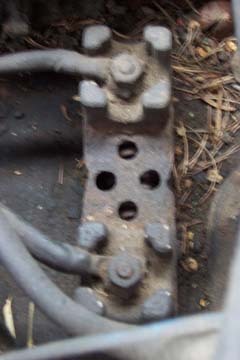 On the next plug to the left of this one, the buss bar takes power to the "inner" side of the plug and goes out through the "outer" connector on the plug. Those bus bars and contact areas on the glow plugs themselves should be cleaned as well. They must be dismantled and re-assembled carefully so as to not "miss" a plug in the series wired set up. If one is not familiar with the concept, it is a great idea to photograph or make a detailed diagram of where the bars, spacers, insulators and knurled nuts all go before taking them apart. If you do not have access to a sandblaster, Emery paper will do fine as well.